Cassidy (Royal Cassidy) is a registered American Quarter Horse. He is a bay roan who at 30 years old is one of our oldest horses. 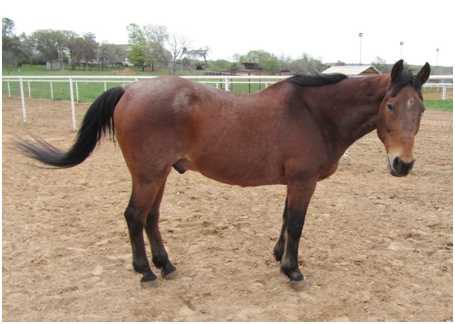 Cassidy has been with us for 12 years now, longer than almost any other horse. He has been one of our top therapy horses since he started here. He is an all-around horse who can carry super dependent riders or be ridden totally independent. Like his friend Easy, Cassidy gets special treatment because of his old age. We only put smaller riders on him especially now that he is really swaybacked due to his age. He and Easy live together in a small private pasture and get special treats made for old horses like them. He especially hates it when he sees other horses getting treats and he isn’t getting any.